Roy Kesey was born and raised in northern California, and currently lives in Maryland. His latest book is a short story collection called Any Deadly Thing. He’s also the author of a novel called Pacazo (the January 2011 selection for The Rumpus Book Club), a collection of short stories called All Over (a finalist for the Foreword Magazine Book of the Year Award, and one of The L Magazine's Best Books of the Decade), a novella called Nothing in the World (winner of the Bullfight Media Little Book Award), and a historical guide to the city of Nanjing, China. 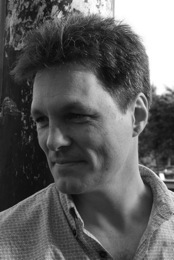 His work has appeared in several anthologies including Best American Short Stories, New Sudden Fiction, The Robert Olen Butler Prize Anthology and The Future Dictionary of America, and in more than eighty magazines including McSweeney's, Subtropics, The Georgia Review, American Short Fiction, The Iowa Review and Ninth Letter. His translation of Pola Oloixarac's magnificent debut novel Las teorías salvages was published by Soho Press as Savage Theories in 2017. Other translations of his from Spanish and French into English include work on behalf of Turner Books, the Ministry of Education of Spain, PromPerú, Ferrovial Agromán, and the City of Santander. For a list of selected publication credits, awards, reviews, profiles and interviews, please click here. For a high-res cover shot taken by Lucy Cavender, please click here. He welcomes befriendingment here and here. As @roykesey he can be followed at a safe distance. Every so often—maybe once a year or so?—Roy sends out an email newsletter type thing about a new book he's got coming out, or a reading tour he's doing, or something else along those lines. They sometimes have news about giveaways and contests and suchlike, and he tries to make them reasonably amusing. If you'd like to get those emails, just type your email address into the box below. You can unsubscribe whenever you want—there will be a link for that at the bottom of every email just in case—and he will never use your email address for anything else, or sell it to anyone at all. Thanks! Original site design by Lincoln Damen, additional design by Eric Abrahamsen. © Roy Kesey 2008. All rights reserved. Don’t even think about it. Stop, drop and roll.